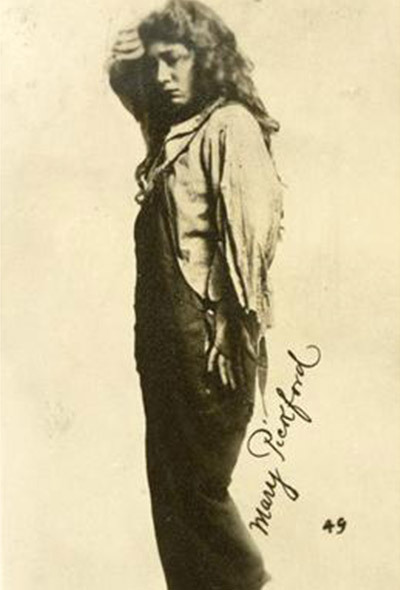 Note: Some sources claim that Pickford was the inspiration for Delano’s novel; whether or not this is true, the role of a fiery mining-town girl suited the actress perfectly and was a box-office smash. According to Mary, it was seeing the large crowds lined up to see Rags that led her to renegotiate her contract with Famous Players. In writing the scenario for ‘Rags’ it is evident that Edith Barnard Delano had the most likable traits of Mary Pickford’s personality in mind and aimed to produce a story in which they might be revealed in all their variety. … From beginning to end it is a picture of the winsome little star in a career humorous and pathetic by turns and occasionally dramatic.